My favorite Korean dishes are Bibimbap and Samgyeupsal. Both of these are served in my favorite Korean restaurant Jang Ga Nae. Formerly known as Minato, Jang Ga Nae is located at Plaza Ortigas along Jose Escriva Drive in Ortigas Center, Pasig, right behind the University of Asia and the Pacific (UA&P). You can tell that it serves tasty and authentic Korean food because a lot of Korean nationals eat here. In fact, it was a Korean friend who introduced me to Jang Ga Nae. I recently treated my family to dinner here and as usual, we were fully satisfied by our orders as well as by the amount of side dishes served. It consists of hot steaming rice, julienned vegetables such as cucumber, zucchini and carrots, sliced mishrooms and bits of beef topped with a fried egg. I usually put just half of the spicy red paste provided before I mix all the ingredients together. 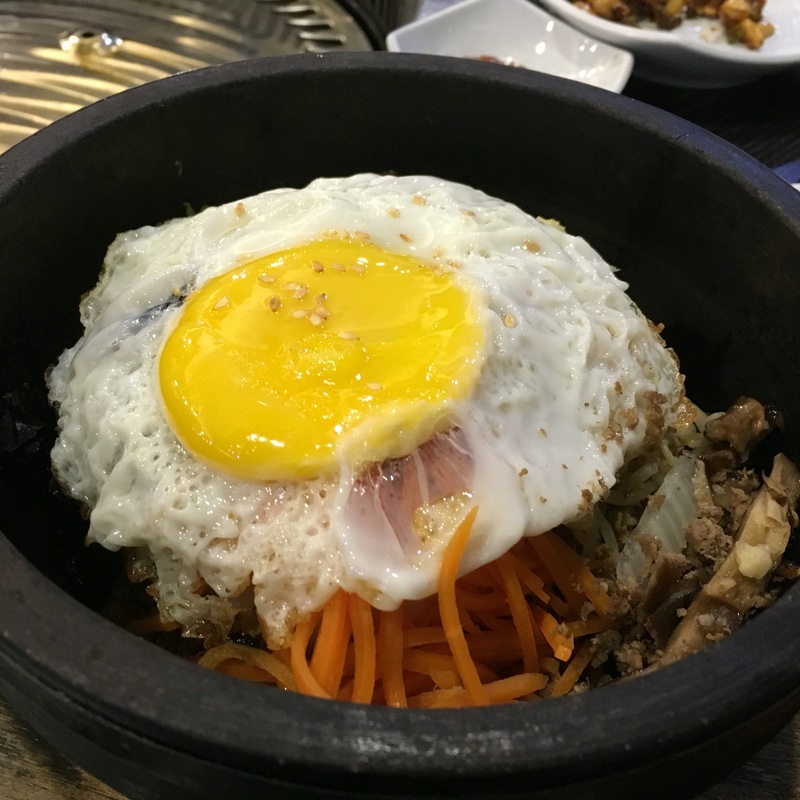 I prefer my bibimbap served in a hot stone pot (Dolsot Bibimbap) so that as the meal goes on, the rice at the bottom of the pot is cooked into a nice crispy golden brown. 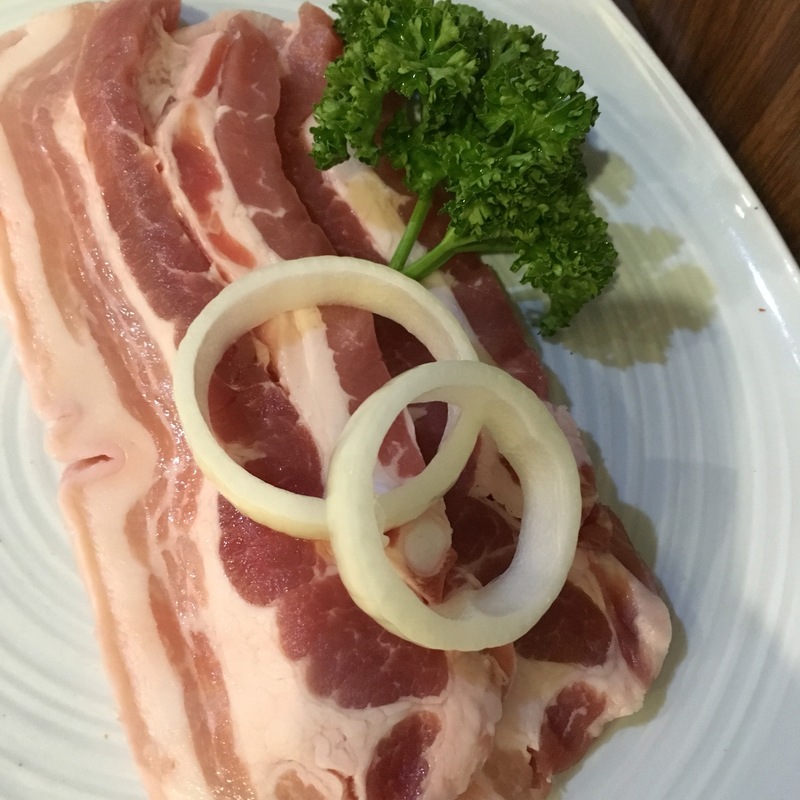 Samgyeupsal, on the other hand, consists of roasted pork belly slices (usually dipped first into sesame oil seasoned with salt and pepper) placed in lettuce leaves together with thin garlic and chili slices. I also like to put some of my bibimbap inside the lettuce leaves before I roll them up to eat. The resto does not serve Korean ice cream but within the same strip mall is a Korean grocery store that sells the treats along with other Korean food essentials. Recently, Jang Ga Nae opened a cafe right next door that serves bingsu, coffee and cakes. Try it out – Jang Da Bang Cafe. I find Korean food very tasty and nutritious and I have somewhat developed a taste for its spicy offerings. Jang Ga Nae will continue to be my first choice for Korean food in Pasig City. Jang Ga Nae is located at 8137 Plaza Ortigas, Jose Escriva Drive, Ortigas Center, Pasig. It has another branch at 237 Aguirre Avenue, BF Homes, Paranaque.